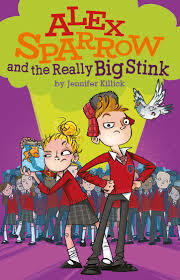 If you like fast paced adventure stories full of humour, fart jokes and great characters, then Alex and the Really Big Stink by Jennifer Killick is just the book for you. Alex Sparrow is a super-agent in training. He is also a human lie-detector. Working with Jess – who can communicate with animals – they must find out why their friends, and enemies, are all changing into polite and well-behaved pupils. And exactly who is behind it all. ALEX SPARROW is a funny, mid-grade novel full of farts, jokes and superhero references. Oh, and a rather clever goldfish called Bob. In a world where kids’ flaws and peculiarities are being erased out of existence, Alex and Jess must rely on what makes them different to save the day. You can’t help but sympathise with Alex, as he has to suffer the indignity of his side effect. But you see him grow as a person, as he learns what true friendship is and the fickleness of popularity. This story values quirkiness and embraces children being different. Even though it’s full of humour, there’s a real warmth and empathy to the writing. The other characters are incredibly well drawn too. There’s Jess, his new brave sarcastic friend, a goldfish with OCD, and a villain so deliciously creepy she makes your skin crawl. Full of hilarious witty dialogue and characters that we can all relate to from primary school, this book had me laughing out loud. With its twists and turns and intriguing plot, I think it's perfect for middle grade readers. I cannot wait to read the next adventure: Alex Sparrow and the Furry Fury.